Elliott Wave Technician Blog: Gold - 11 year cycle topping ? Gold - 11 year cycle topping ? The 11 year bull market cycle in gold is coming to an end ? The intraday low of gold was in 1999, but the daily close low was in 2000. This indicates that a long term top in gold is due in 2010 or at the latest in 2011. A correction taking gold to less then USD 1.000, and possibly as low as USD 680 in the next few years is likely. There is also a larger 64 year cycle in gold. The last top in this cycle was in 1935 and the last bottom in 1999. 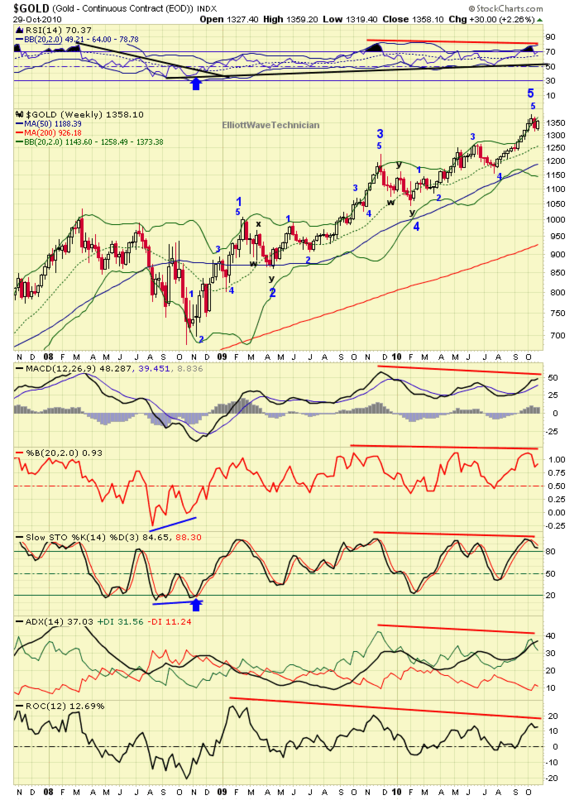 The next top should then come in 2063. In this context the next intemediate bottom in gold will be a great opportunity, but it is at least a few years away. 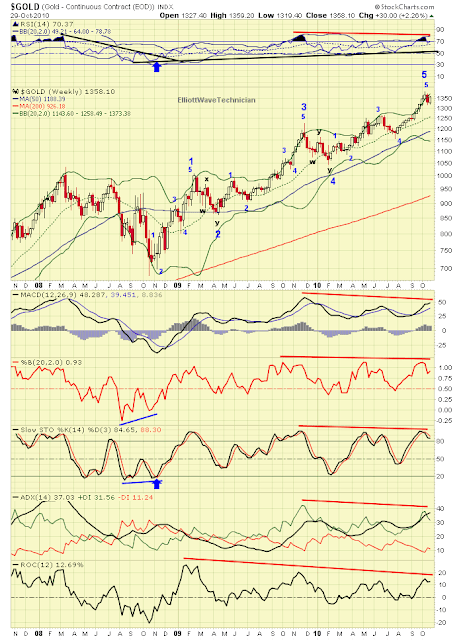 Long term negative divergence on the technical indicators. The 5th wave in commodities can extend, and is usually the longest and most powerful wave in the structure, so it could still go higher. However, sentiment on precious metals are at an extreme. The surveys we follow have all reached extreme optimistic sentiment readings associated with at least intermediate tops. The sentiment can of course snowball, but that would be difficult to sustain. If gold continues to rally the wave relationship points to USD 1371 - USD 1386 area for a long term top. A close under 1296, the previous 4th low, will indicate that a long term decline is in progress. The above is an extract of our investment newsletter published 31st of October 2010. See more gold charts and more about other financial markets in our latest ElliottWaveTechnician October 2010 Investment Newsletter.